An Interview and Giveaway with Chris Davis of Davis Leatherworks – Pens! Paper! Pencils! 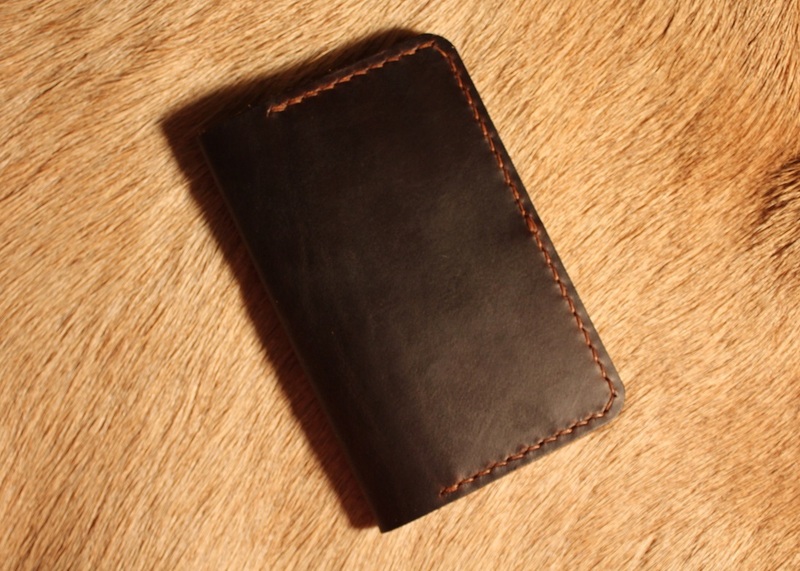 Anyone who’s followed this site for more than a few minutes will know I have a great fondness for Davis Leatherworks’ notebook covers. They are simple and functional and they are oh so beautiful. Often we buy these lovely handmade products and know nothing about the people who make them. Being the nosy person I am, I wanted to do something about this. So I asked Chris Davis if he’d mind answering a few questions and he very kindly agreed. Be sure to read all the way to the end for a fantastic giveaway. Why leatherwork? What got you started? Well, let me tell you a little about myself in lieu as to why leatherwork. I’m a twenty-three year old college graduate, married with a almost five month old son, and I’m about completely useless when it comes to working with my hands (a problem I am actively trying to remedy). Growing up in this modern generation, I found myself surrounded by video games and computers. While I enjoy them, even to this day, I knew that wasn’t what I wanted to do with my life (just a few sessions fixing family and friends’ computers showed me that I don’t have the patience to work in technical support). After I met my girlfriend, who is now my wife, I learned that her father is a blacksmith/blade-smith, and that he also made his own leather sheaths for his custom-made knives. I watched as he designed patterns, cut the leather, and stitched it up, and I thought to myself, “That looks like something I could do…” My first work was definitely in the realm of interesting, but I was able to stick with it and learn, improving my skills as I went along. The leather you use is beautiful. Where does it come from and how do you choose your suppliers? Most of the leather that I choose to use, especially when it comes to notebook covers, is from Horween of Chicago. Established in 1905, Horween pride themselves on their fine leather which is tanned and finished here in the United States. That’s one of the major things I look at when I go to purchase leather. Where did it come from? Most of my suppliers obtain, tan, and finish their leather right here in the USA, which means that the leather cost is higher, but also seems to result in a finer, more consistent product. What, for you, makes leather such a beautiful material? To me, the most beautiful thing about leather is it’s flaws. Sure, you can finish leather so that it all looks just about the same, but give me a piece of leather that has some scratches, some scars, and some imperfections. Through these, I can look at a side of leather and not just see a material, but I can see the lifespan of the animal that the skin used to belong to. I can see where one particular cow got too close to a barb-wire fence thanks to the scratches on the backside of the hide. I can see where a rancher made his mark using a branding iron, and the skin healed up leaving the brand there for eternity. Another thing that makes it a beautiful material is that each piece of leather is unique. No two cow hides are exactly alike. No two tannages are alike. No two finishes are alike. Each time I place an order, I look forward to being able to open the box, roll out the leather, and run my hands over it. There’s no other material in the world that feels quite like a beautiful piece of leather. Where do your ideas come from and how do you go about developing a new product? There’s a verse in the King James Bible in Ecclesiastes 1:9 that says, “The thing that hath been, it is that which shall be; and that which is done is that which shall be done: and there is no new thing under the sun.” One of the biggest challenges is to design a product that is not, in some way, influenced by another craftsman’s work. A major part of my job is to gauge what consumers want. I do this by following several different forums, watching what major accessories brands do, and by looking at the work of other craftsmen. When I see that another leatherworker has created a product that is selling very well, I look at the major aspects of the product. Why is it popular? How is it different from something I’ve made? Then, I draft up a couple designs, trying to make changes in the design that reflect my personality and skills. It’s a difficult process, because as I mentioned before, “there is no new thing under the sun”. If I were to sit down and design a product with no influence from any other maker, I could probably get online and in no time find an existing product that is mirrored by my own. The first step in designing a product is to define a need. What would my customer want to buy? Sometimes this even refers to what would I want to buy. The next thing is getting the design from my head onto paper. This step is one of the longest, as it sometime can take several drafts before I get to where I’m comfortable with the design. The third step is to transfer the pattern to the leather, sew it up, and finish it. The often necessary fourth step? Back to the drawing board. Occasionally, a design won’t come out quite right or after I finish it I don’t like the way it looks. I’m not an engineer by any stretch of the word, so product design is somewhat of a hit or miss. The rejects are stored on a shelf in my shop, and often as I’m working I’ll go back and look at what I’ve “messed up” in the past and learn from those mistakes. Lastly, is the test phase. Before I release any product on the market, I try to carry it around for a month or so. I want to make sure that my design will hold up and work the way that it should. What is your process for making a notebook cover? First, I select the leather and check the cutting area for any major defects/issues. I generally cut each and every cover by hand with a razor knife, but if a customer custom orders a large quantity (over 50), I use a die to punch the covers out on a hydraulic press. Once the covers are cut, I then punch two holes in the centre of the cover at the top and bottom. These are then sliced through and an appropriately sized elastic band inserted which holds the notebook in. I them emboss my logo on the back of the cover using a custom-made stamp and mallet. Then, the second smaller band is tied on the first to acts as the closure for the cover. I then slide a complimentary Field Notes notebook in, pack it up, and ship it out to my customers. What do you feel makes a great product? I feel a great product can be told by attention to detail and craftsmanship. While there are some who can sew an amazing line with a sewing machine, I prefer the little quirks and oddities that come from sewing a project by hand. I like to see where the craftsman has left his/her individual touches on the product. Some may call these defects or imperfections, but as long as they don’t hinder the use of the product in any way, I see them as evidence that someone has put time, effort, and love into something that they hope will last for a long time. Can you reveal any future plans or products? As of this time, I’m slowing down development for the Thanksgiving/Christmas season. It’s common for me to receive a ton of custom orders around this time of year, so development of new products generally grinds to a halt. However, I can say that if you are a fan of the Field Notes brand of notebooks, you should join the Field Nuts group on Facebook (if you haven’t already). 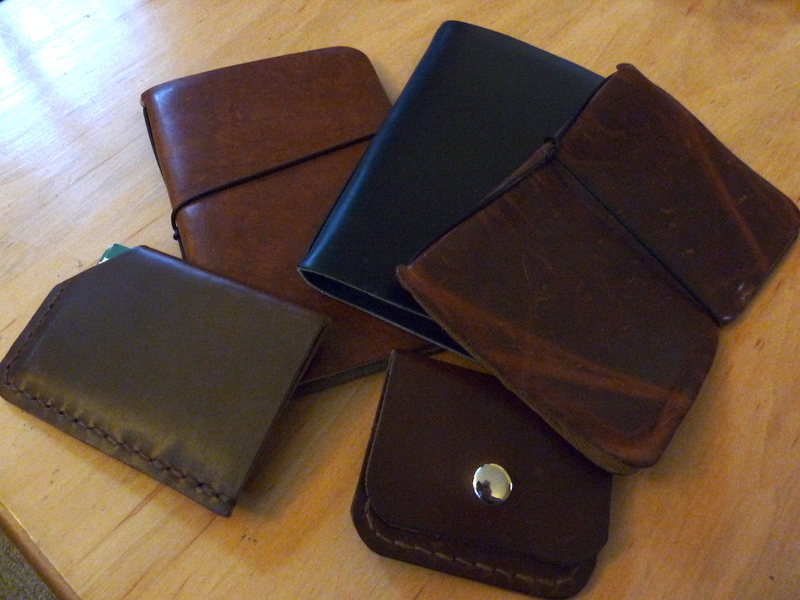 Davis Leatherworks is coming out with a set of custom-branded covers for them. The first (our standard cover with elastic bands) is already available for pre-order in my online store. The second will be a flap-style cover with a credit card/id slot or two. The third will be a flap-style cover with receipt/scrap paper storage. I’m really excited to be able to work with such a great community of awesome folks! Thank you so much Chris for taking the time to do this at what is such a busy time of year. Please be sure to head over to Davis Leatherworks and support a true craftsman! How would you like to win the brand new ‘Card Slot’ Field Notes cover featured in this article? This is Horween Brown Chromexcel, Hand-cut, Hand-sewn, Hand-crafted in the USA, pure loveliness and is a brand new line from Davis Leatherworks. Now obviously if you win you will very quickly put a notebook of your choice inside the cover. To enter this giveaway, you need to leave a comment explaining what you will use that notebook for. This is open to anyone, anywhere. The winner will be picked randomly on Saturday 28 December. I’ll then contact you by email and you’ll have a week to get back to me with your postal address. If I don’t hear from the winner in that time I’ll pick again. Please note that if you live outside the USA it could take quite a while to get to you and I won’t be responsible for any customs delays or charges. Thank you Chris for donating this fantastic prize! This giveaway ended at 6pm GMT Saturday 28 December 2013. Please see here for the winner. Thank you to everyone who entered. I use Field Notes primarily as sketchbooks for my illustration work. I’d use the new cover as a sketchbook cover and simplified wallet. This was a great interview with Chris! Thanks for posting! Between work and play I use field notes all the time. I work at a precast concrete company and am often camping/hiking. Both of these environments have wreaked havoc on my notebooks. I carry a small notebook with me everywhere. I run deliveries and use it to take notes on what customers are telling me and what I need to do when I get back. I use it to write down grocery lists. I doodle. It is the extra storage slot for my brain. I carry a notebook with me everywhere I go, to keep track of everything I can. It’s helped a horribly mismanaged mind such as mine, stay focused and on track. Be it list, notes, ideas, reminders, contacts, or inspiration. I use a notebook everyday to keep the mundane from becoming muddy and messy. I would use this notebook for the same everyday habits. I carry a 50-page notebook everywhere I go. It’s a perfect-bound notebook I designed and make by hand. I call it SlimNote. My dream is to write a novella within my SlimNote, starting with the first sentence at the top of the first page and sustaining a narrative until the end of the notebook. I would use this beautifully crafted leather case to carry around my future novella. Great interview! What an excellent tour of a splendid lot of notebooks. Happy to be here and that’s one mouth-watering giveaway! This will be perfect for a dedicated shopping list notebook, with the card slot used for credit and discount cards. Thanks Chris and Ian for the opportunity! I use my notebooks as a way to track what I do in my day-to-day life and transform it into some adventure so when I reread it it seems as if I live in a world of battles and great good and evil when in fact maybe I had just taken the bus that morning. A great way to enjoy the ordinary. This cover would put a wonderful theme- befitting with the writing- on my plain notebook. I always have a notebook at hand, for all those random thoughts and details and plans that would so quickly escape me otherwise. I’ve recently begun to delve into the world of penmanship and fountain pens, and so have taken to carrying a notebook around with me everywhere. I live on a few acres so it would be wonderful to have a durable notebook that could travel with me in order to jot down notes, thoughts, observations, or just practice my cursive. I often visit customers and need to take notes, I always avoided bringing Field Notes but that cover would definitely allow me to bring my favorite notebook at meetings. I’m a college senior about to graduate into the world of hand made crafts. My major and life pursuit is jewelry. I’ve been a jeweler for 10 years, starting my first apprenticeship at 11 years old. I’m embarking on a trip from Pennsylvania to San Francisco this winter to try and find a job, if I won I’d take this beautiful book cover with me to keep records of my travels, my thoughts, ideas, interview notes and drawings. I’m tired of having all of my pocket notebooks rip and become torn, with a nice cover I wouldn’t have that problem anymore! Very nice interview, always love to hear about other makers. I carry always a Midori Traveller’s Notebook with me and using it to keep track of everything. I carry a field notes notebook around with me everyday. I use it as a quote book for any interesting speeches, ideas, etc that I come across during the day. My notebooks continually fall apart and having a cover would be absolutely fantastic! I am getting ready to start a weight loss program through my work and I have to keep notes on what I eat, excised and meeting with Dietician. This would be very handy to do that in and I would love some of Chris’ work. I have been using field notes as a way of remembering day to day tasks, using a sort of bullet journal system adapted to my lazy shorthand. I love the idea of these awesome, hand-crafted covers as a piece of incredible utility being taken around in travel. whenever I go window shopping I end up buying a lot of unnecessary things because my memory isn’t that good when there is too much information!so having a notebook with a cover that can hold my cards and money might help me keep track of needs and stuff with good prices!!! I carry my FieldNotes all day with me for quick notes to remember all the small things in work & life. I’m going to Italy very soon. I would use this cover to carry my travel journal and notes in. I use Field Notes notebooks for everything! Anything I need to remember or anytime I need to take note of something I write it down in a Field Notes that I keep in my pocket. Then, at the end of the day, I go through and organize the information however I need to. Always have a notebook on me, and this would make an excellent protector for it as I continue to try to figure out whatever the hell it is that’s always trying to get out. I always carry a Field Notes book with me -to record thoughts -scribe lists and keep a tab of my spending. Thanks for the generosity. This would be a field notes holder for me as part of my daily journal. Pocket cRry for random brain dumps! I journal extensively (and hand-make my own journals). I would probably make a custom journal to fit the leather pocket! I use a small notebook everywhere i go at work to keep track of the items for the multiple projects I have going at any given time. My brain has too much running through it to survive without a small notebook and this cover would fit in wonderfully. I normally carry one around at all times for to-do lists, groceries, notes. I normally use Field Notes to jot down to-do lists, things to buy, recipes, and drawing up woodworking ideas. Fingers crossed on getting picked! I would use it to jot down ideas or concept sketches for leather projects I’m working on or plan on working on. Much like Mr Davis, I enjoy working with leather and love rolling out a hide that just arrived in the mail. I’d use mine when I’m tramping the Dorset hills or on Dartmoor. It would mould itself to my pocket when I wasn’t scribbling down ideas. The leather’s markings would tell the story of each expedition and become as familiar as my favourite leather boots. I’d put my EDC notebook in it. I’m always carrying it around with me at school to take down notes of what I have to do later, people’s phone numbers, and any other things that happen to pop into my head that deserve writing down. Great story behind the scenes. As a budding woodworker I appreciate the desire to work with our hands. I would love to win and I would put it to good use carrying my small everyday notebook around that today I call my TO DO list but in reality it ends up being a mini journal. Thank for the giveaway! I’m looking for a new sketch notebook, so that is what I’d have in mind if I were lucky! These look gorgeous though, so maybe I will get myself a Christmas present! I would use it to make other notebooks jealous! This cover and note book would replace the note cards I carry every day to capture my random musings. I have two Field Notes notebooks in my bag at all times. One is for shopping lists, random notes, things I just need to jot down. The other is for pen and ink info, keeping track of inked pens and ink sampling. Quotes also end up in this notebook. I am a writer so I always have a notebook with me. Never fails I get some of my best ideas when I’m far away from my computer. I use my notebook to write down any and everything. Or else it is gone. I’m a middle school science teacher and the technology coordinator at my school. I keep a pocket notebook for a variety of things- lesson plan ideas, “to do” lists, info. for the school website, Christmas gift ideas, etc. If I don’t write it down I won’t remember it. I don’t know what I’d do without my notebook. Davis Leatherworks is awesome, thanks for a cool giveaway! I carry my notebook everywhere and jot down notes all day so that I remember stuff I need todo. I’m a compulsive doodler, so it would be a sketchbook holder – with all the little notes of things I have to remember right beside the doodles. I use my Field Notes every single day, either its taking notes at work, making grocery lists or random ideas. Winning this leather cover would allow me to protect my Field Notes just a tad bit better than I do, it gets a little beat up traveling in my back pocket. I love the look of this Field Notes cover. This would be so useful. Mine always get so ratty looking. I have a Field Notes Expedition Edition that probably doesn’t need a cover, since it’s “indestructible,” but it would be really classy to have this awesome leather cover for it! I would immediately put a homemade daily ‘chronodex’ (5.5X3.5) for my planning and to-do list. I use one of Chris Davis’ standard notebook covers to hold 2 Field Notes notebooks. One is for capturing anything hat is on my mind, making lists, or just doodling with new pens or inks. The other is a more structured weekly agenda (left page) and weekly todo list (right page) to help me stay on track and get things done. A cover with a pocket would add some additional functionality to this system. I use Field Notes as the primary gathering medium for my commonplace books. I am never without one and a cover will protect them a little. I would use this awesome accessory with my Field Notes. I’m a writer and carry FN everywhere for capturing ideas, dialogue snippets and whatever else comes to mind. Thanks for the opportunity to win such a fantastic item! With one of these beautiful notebook covers, I will IMMEDIATELY insert my daily Word. notebook that holds the entirety of my GTD Next Actions list. It travels everywhere with me and gets pretty beat up. I would use my notebook for my daily notes and to-do’s in class and out of class! I would use it to hold my notebook in which I keep my tarot notes!!! 😀 Thanks for the giveaway! I’d use my notebook for field notes. Having a cover like the one that is being given away would help ensure that my completed Field Notes still looked presentable, unlike the dog eared messes that they currently are after having lived in my back pocket for weeks on end. I use field notes all the time – for lists of tasks or facts, thoughts, and misc notes. A cover like this would really protect the Field Notes notebook from getting scuffed and crinkled! As if one needs a justification for carrying a notebook with a beautiful cover! And carrying it around is what you would want to do with a cover like this. Not only would it protect the important notes of the day, but it would look stylish doing it! I’ll crack open a pack of precious Night Sky and slip one into this cool cover. Well, I love 3 things… Good paper, fountain pens & leather. Bridging all these together only makes sense! Currently I tote a passport wallet with 3×5 cards in it as well as a tiny moleskin in my jacket. It’d be awesome if I could combine it all. Basically it’d be a EDC for me. Notes on side business ideas go there while I run the gauntlet through corporate america…. I would use the “card slot” cover to protect my field notes Pitch Black addition. In it I would mark down all the funny quotes I hear every day and all the things I want to research later. I would use it as a journal. So often we don’t take time to appreciate the special moments because we dwell on the negative. A gratefulness journal would help me refocus each day on the positive experiences of the day. I would use it to cover the notebook I use to,track my hospitalized patient observations for further review and study. By having it close I can use the information from one to help the next. I will use the notebook to capture my daily thoughts, as always. And show off the new leather cover, of course. Great work, keep it up! I need the leather cover for my notebook which I always carry with me to protect it. This notebook will be used for writing dreams and poetry, and will be shared with my friends and family. I’d use this to take notes and capture thoughts when I’m out and about. I’d use it to protect my newly acquired Field Notes! I enjoyed the interview. I keep a small notebook with me all the time. I would love to have a nice cover. And Field Notes books are great. I would like to use this cover to put in my 9×14 daily moleskine agenda on one side and on the other my beloved Field Notes that I use to carry around to hold records of important thoughts that I transform later in lyrics, creating poetry and songs. I also use them for a quick sketch, and of course that card slot would be ideal for my bus card or to stash some cash. I have bought a lot till last week from Chris to please some friends while looking for a perfect gift for them. I still don’t have such a beauty and I would really be the lucky one to win it. Thanks anyway for having given me the chance to try! This year I plan to use a Baditapple Carnet PeeWee Weekly Planner as my Diary. So this would be perfect! I wish I could use Field Notes because I think the covers/themes are great! I use fountain pens and the paper is just not fountain pen friendly unfortunately. I think I would use a beautiful notebook like this as a guest book/log book to keep on a sailboat. I would use this wonderful giveaway as a cozy resting place for my beloved Doane Paper Utility notebooks. Hi! I’m a Geologist, in fact i’ve graduated this month, and notebooks are one, if not the most, important tools of my work. In those pages we put our observations, our thoughts and interpretations. I have used field notebooks in the last five years, mainly ‘geologists notebooks’, with tables and graphs, which help us in the field, but always ends up with big stains and heavily worn off, after all, its not an easy life in the field. So I would use this cover to protect the most important thing in my career, my thoughts, my knowledge! Quite like Elysse I recently got converted to a pen and FN addict via Brad Dowdy. I used to have little pueces of paper with notes scribbled on them everywhere in my room. Now I’m trying to centralise it in two Field Notes notebook. One for tasks and one for all the rest, doodling, working on a retro synthesis, that kind of stuff. It’s pretty rare that I don’t have a notebook with me and they start looking pretty worn as they get close to being filled up. One of these covers would certainly help keep things looking a little more professional. I carry a Field Notes or Doane Paper pocket notebook for everyday notes and lists that I want to remember. The cover woruld provide some nice protection for the notebook. I would use this to take notes in my church service. I use three field notes notebooks : a blank one for drawing, a gridded one for notes and a lined one for todo lists … No more loose notes or doodles ! After growing tired of using my iPhone as my daily inbox, I’ve switched to good old fashioned pen and paper. It’s the only way I function these days. Chris Davis does some great work and this would help my “inbox” last a bit longer in my back pocket. Thanks for introducing me to Davis Leathers. I, too, like the feel of fine leathers, and appreciate quality handmade craftsmanship. Hope I win, but win or lose I’m heading over to Davis Leathers ! I would give it to my 9 year old daughter. She has started writing a diary and is writing all the time. She would love it. Thanks. Always carry a field note with me in case something urgent that requires me attention pops up and I have to Remember it. This would be a perfect cover for my field note. The main purpose of a notebook so elegantly clad is to provoke envy in all who see it. I carry a small notebook and my Lamy Vista to take notes, doddle, and to try new inks, so a leather cover would be handy to carry my notebook. Great giveaway! Thanks for the giveaway. I use notebooks to remember things, as forgetting is my primary weakness. I would put this lovely case in my purse to jot notes on the go!! Thank you for the chance! I would use it to write my crochet designs. I have M.E. so have to write everything down. I hope I can bring smiles with the crocheted items I make. Oh, I would love to win this to hold my daily carry Field Notes book. Fantastic! Thanks for this giveaway! One of my goals in 2014 is to “get it together” and be more organized, so I would love to have a small notebook like this one to carry with me in my purse. I’d write notes, grocery lists, birthday reminders, quotes to remember, and all other kinds of things in there. Thank you for the lovely giveaway! I would fill it with my favorite field notes. Thanks for the opportunity. I just started a new job, and it requires me to learn a lot of new things quickly. I’d use a small notebook to keep all of that new information organized so I can learn it more quickly. I love to carry a field notes with me to write down all kinds of things, notes at work, reminders, grocery lists, etc. I will definitely use this gorgeous cover to protect my art journal!! Looks like it would be a great way to protect the Field Notes Brand memo book that’s always in my back pocket! I’ll use it for my study papers and my hobies. 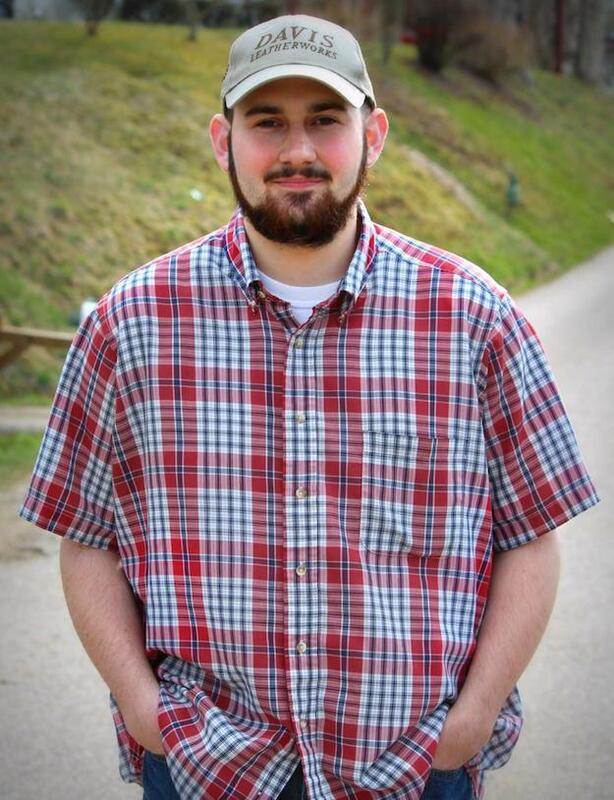 I’m from Croatia and I’m studying telecommunications, but my true love is airsoft and I really need something for organizing my tactics plans. My Field Notes bullet journal needs a durable home for the gauntlet I put it through everyday! I always carry a notebook around with me to jot down writing ideas that might pop up when out and about. This would be a great companion to carry around! 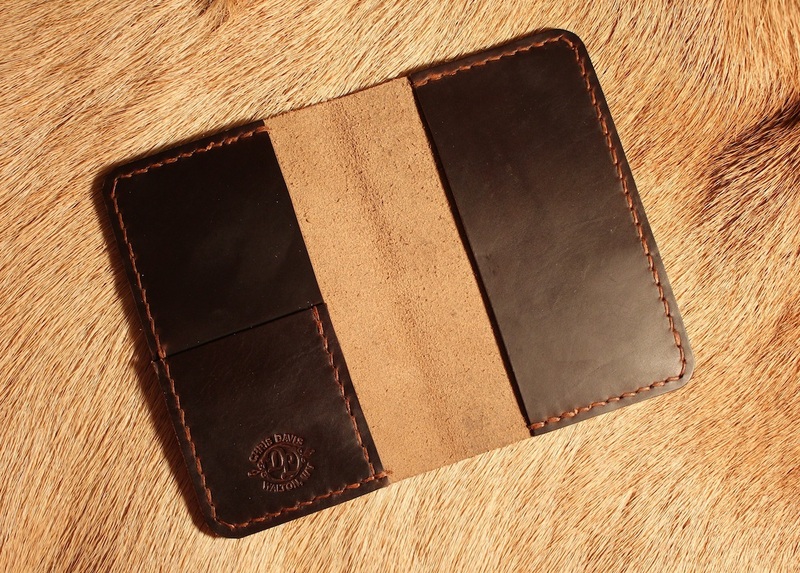 There’s nothing like well crafted leather covers.